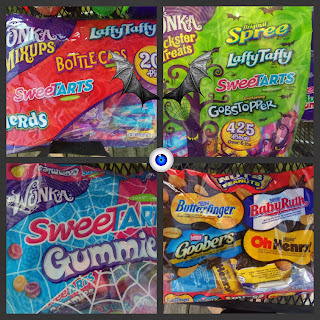 A prize pack of scrumptious Halloween Candies courtesy of Nestle (see above) This is several POUNDS of candy for one lucky winner! arv $40 Nestle has a huge variety of some of the best candy around! They make my all time favorite Butterfinger! (This will have TWO (2) Winners!) Each winner will get a prize pack of Hersheys full size Candy Bars courtesy of Expressionables , So Cal Coupon Mommy and Dixieland Mom arv: $25 each Expressionables offers a huge variety of personalized cards, candy wrappers, wrapping paper and more! Visit them for all you custom needs! Check out our review to learn more! 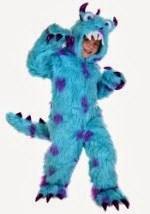 A Halloween Costume -from Costume Super Center Sullivan the Monster Costume arv-$85 Costume Super Center offers a huge variety of costumes for every need! The Widows Walk League (Halloween murder mystery)- Courtesy of Author Nancy Lynn Jarvis: Read the Review Here! (from the cover:) Santa Cruz husbands are being murdered. The local news media is buzzing because a dark-clad figure witnesses describe as Death had been seen lurking nearby each time a murder is committed. When new widows start hiring real estate agent Regan McHenry to sell their houses, she discovers all the murdered men have something in common: their wives belong to a walking group called The Widow’s Walk League. No wonder Regan is worried when the group’s leader starts paying special attention to her husband, Tom. 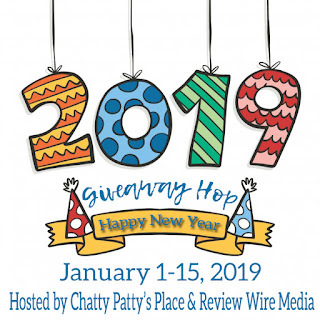 Regan invites you to attend Woodies on the Wharf and go to a séance with her as adventures unfold and she tries to keep her husband safe in the fourth book in the Regan McHenry Real Estate Mystery Series. Regan’s best friend, Dave Everett, Santa Cruz Police Community Relations Ombudsman, is back to lead a new cast of quirky characters and struggle with Regan’s amateur detecting. arv$12.95 This book will keep you turning the page and is very hard to put down!! A Dog-E-Glow dog leash and collar, in Halloween them courtesy of Dog-E-Glow. 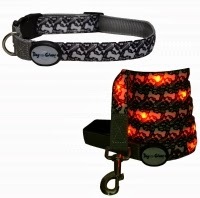 arv:$55 These collars will light up and you can even set them to flash to make your pet more visible! Read the full review here! 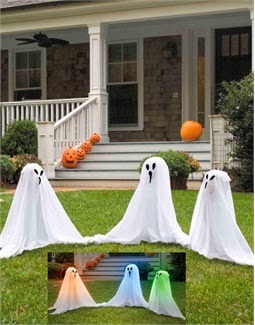 Set of 3 (19" each) multicolored light up ghost yard decorations from Forum Novelties arv: $25.00 This cute little set of ghosts would be an adorable addition to any yards Halloween decorations. 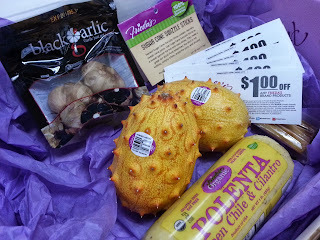 What a fantastic giveaway with all these cool prizes. Good Luck! 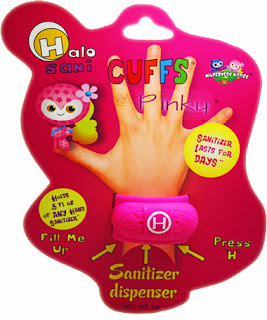 **Disclosure: Mom Does Reviews will be partially responsible for some prizes fulfillment. 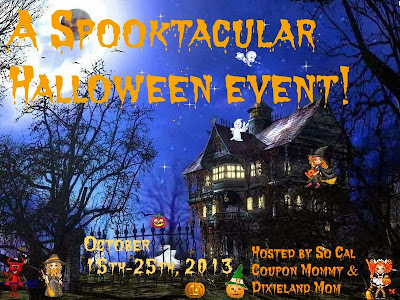 If you have any question please send an email to marie@dixielandsdeals.com. 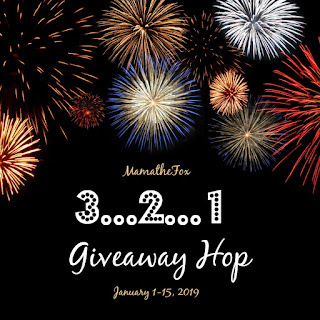 All entries are optional, if you do any of the tasks you can collect the entries, but if the winner task is a task you did not complete, a second winner will be chosen. Epic Fail for Martha Stewart! !